Zahra Aboutalib carried her unborn baby for nearly half a century. In this captivating story, her surgeon and doctor give details on how her child died, how it lived in her that long and why it in no way killed her. Zahra was 26 after she got pregnant however; she did not deliver her child until nearly half a century afterward. Her amazing story starts in 1955, after her waters broke and she visited a hospital to deliver her child. A few minutes before she could see her doctor, she witnessed a woman and her child die throughout a Caesarean section. Frightened, Zahra took off from the hospital. The child stopped kicking while on her way home. She strived to disregard the child in her womb and determined to trust in the legend of the ‘sleeping child’. In Moroccan society, it is assumed that babies can survive in a person’s womb to guard her honor. Even though Zahra’s reputation did not require safeguard – she was married – this conviction gave her console. In addition, amazingly, her periods started once more however she in no way fell pregnant once more though. Therefore, two years later on Zahra and her partner adopted three kids, relaxed to family life, and stopped thinking about the ‘sleeping child’. 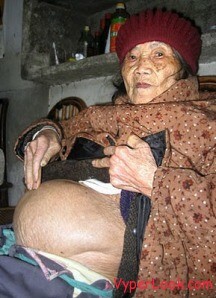 For more than 40 years, she sustained excellent health until crippling stomachaches struck her one day. An ultra-sound exposed her ‘sleeping child’ was, actually, an ectopic pregnancy, which means the baby grew in the fallopian tube. Rather than being disallowed or breaking Zahra’s tubes leading to death, it had been received as just a new organ, although it was lifeless. Now, 47 years behind its expected date the child was taken out through Caesarean section. 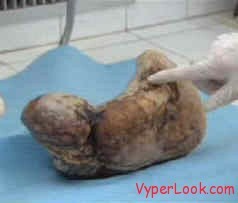 It was 17” long and weighed over 7lbs– the normal weight and size of an infant.